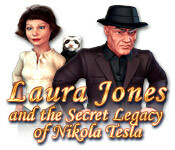 Laura Jones and the Secret Legacy of Nikola Tesla is rated 3.6 out of 5 by 17. Rated 5 out of 5 by sagesunrise from Cleverly surprised with the challenging mini games I really enjoyed this game. It had mini games inside, as well as Hidden Object games, that I found challenging. I have played HO games for many years and this one was the most challenging of all. I was quite surprised at this because it is one of the older games in my collection. It had a cute/fun story line with a little ferret involved that liked to play hide and seek. I love how it was packed with side games with some good morals to the story that could be taken away, such as suspended judgement of people. Rated 5 out of 5 by MEnr56 from GOOD INTERACTIVE GAME I enjoyed the involvement that was had in playing this game and also the lack of wandering around wondering what next to do. The tasks were somewhat difficult as the hint was not always helpful and you were left wondering what to do with the pieces; also sometimes it was a bit confusing as to what pieces you needed to pick up; though, once started it was easy to continue on. The last set of mini puzzles have NO SKIP to them so be prepared to spend some serious time in putting the last picture puzzle together; referring to the walkthrough as to what it's to look like was very helpful. The other mini-puzzles were not difficult -- at least not for me, anyway. All in all, the storyline was good, the voice-overs very good, and the tasks were credible. Rated 5 out of 5 by OvrThRainbo from Great fun and storyline; immersive atmosphere. LOVED the ferret! I know another reviewer was bothered by the ferret, Ferris, but we enjoyed his antic, comic relief. This IS a traditional HO game with some great mini-games thrown in (could have had some more of these). The graphics were atmospheric and beautiful. The story line and eccentric characters made for quite an adventure. I actually played this sitting side-by-side with my partner (a game beginner), each of us taking turns playing scenes or one of us finishing up an HO or miini-game when the other one got stuck. We've been so hooked on this game that we've hardly gone out of the house. 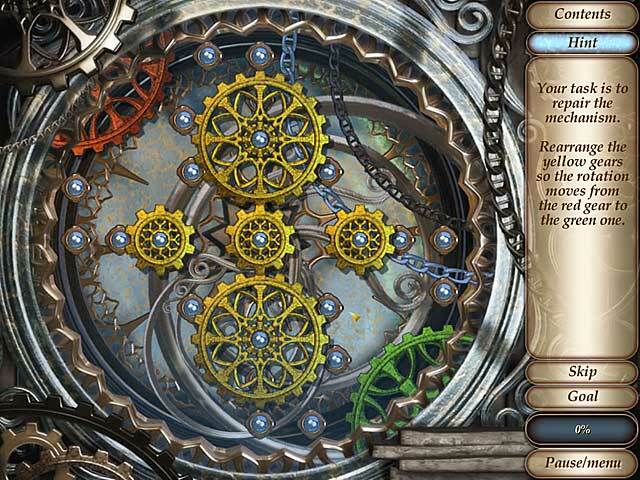 The theme referencing the great inventor Tesla warrants bonus points for this game! Rated 5 out of 5 by Amijane from Not an average HOG at all! I bought this on sale and I'm so glad I did. This is much more an adventure game than an HOG. Playing for more than an hour I only had one HOS I call regular (find a lot of this and that for no obvious reason) and that was because I skipped a minigame. You got the HOS challenge instead. Apart from that it's been finding things for a purpose and playing hide and seek with Laura's gorgeous ferret a couple of times. The sound and voice over and the character animation is very good, but finding stuff can be a bit hard sometimes 'cause the background graphic is not as good. On the other hand it's a lot of interactive scenes to find things in which makes it really fun. Absolutly worth not only sale but full price! Rated 5 out of 5 by Tygrepawz from Action packed adventure Once I figured out the last puzzle at the end, I really liked this game. It's light, fast paced and no back tracking like many of the other HOGs. There are some sticky spots, enough to keep you interested but not totally discourage from moving to the next level, the hints button is a bit slow but in the meantime you can pick up a missed object while it recharges.There was an error in the last puzzle but I've posted the correction on the forum. Most of the trials were easy enough but if you didn't want to do them there was an alternate HO scene you could do instead. Be warned, at the last puzzle if you leave without finishing a level it will reset & you'll have to start over and redo the ones already completed. I finished most of it in one night and came back the next afternoon to try to complete the last level when I found the error, after that it was a quick finish. Overall, it's a good family type game without any occult overtones other than sneering villains out to get the invention. One thing I didn't like was the ferret. OK, he was cute but wasting time chasing him around was a bit overdone. Rated 5 out of 5 by chiari_survivor from Awesome Deal for DD at $2.99! Game is by Astar Games, Nevosoft, also the makers of Mushroom Age, Vampireville and the part one of this story but they can easily be played out of order. I actually think it is better NOT to play them close together as they seemed to create characters that looked VERY similar. So one stories "bad guy", looks like the other stories "good guy"...a bit confusing. The main character is Laura Jones, a young adventurer who is accompanied by her pet ferret, "Ferris", who loves to play hide and seek. Laura picks up a puzzle box, left to her Gramma, by Nikola Tesla. Nikola Tesla invented something that if it fell into the wrong hands,could be quite dangerous. To help safe guard the item the parts are divided up and given to several of his friends or associates who promise that they or their desendants will safeguard the item they have been given and they are to put any person requesting the item through some creative tests. I almost deleted the demo when I had to search her bag for the third time, and again when trying to get into Gramma's house but I am VERY glad I stuck with it through the demo. I purchased as a DD and played straight through. The music was annoying at times so I turned it down low. I also noticed 1 "bad word" near the beginning for those with children. You can choose to skip the mini games and do a HOG instead, but I loved the mini games. I checked the table of contents page once I completed the game and found that there were 14 levels and 18+ various mini games. Ten of the games were available to play seperately once you finished that level but you can also go back in and play any level so you are still able to replay the parts you like without having to replay much of the other parts of the game if your favorites are not one of the 10 offered. A few of the games are new to me but most are commonly seen. Some of the HO's are small or difficult to find. Most of the mini games are well explained and not too difficult but a couple take some real thought. For example, I was playing the extras after I completed the game and I came to an "untangle the string" that had 30 starting ports and up to 8 strings on each port...Yes, that one took awhile, but I love this kind of challenge! Mini games offered *Untangle the string *Catch the Mouse- Hat Drop- new to me *Lock *Block the Motorcycle- new to me *Gears *Tangram *Reversi *Pipes *Catch the falling Eggs *Puzzles Other games occuring within the game *Find the Difference *Crystal Gem, Knock out *Ball Bearing through A Maze *Catch the Mice- slightly different than the other mouse game *Globes in Order *Hangman *Balance weights *Cooking *Fireworks Dragon- new to me Though the graphics and story do not compete with ERS games, this game has good replay value since you can choose to play through the story line choosing to play only the HO scenes or just play the mini games. Plus you also have the extra games available when you access the mini games from the menu page. Throw in that this game is being offered as a DD for $2.99 and it is an AWESOME Deal! Rated 5 out of 5 by ffuryy50 from Tons of fun! Enjoyed this one very much.... It had me chuckling a good bit! Loved the ferret! Good mix of HO and mini puzzles with very clever twists on the puzzles.... and some I've never seen before --not your same ol' same ol'. If you skip a puzzle, you must complete a junkpile HO scene.... 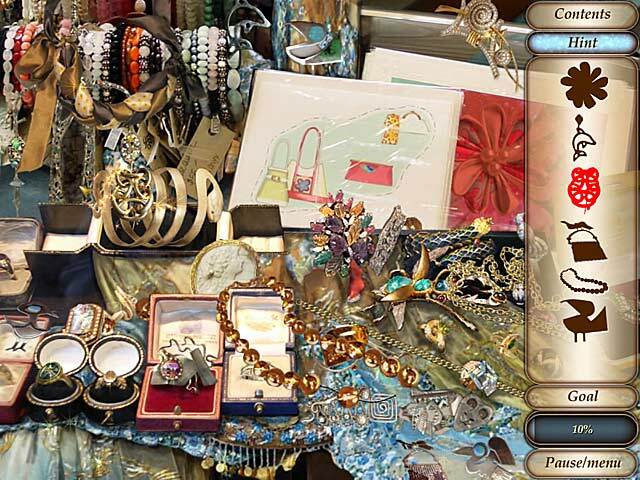 Thank goodness I only had to resort to the skip once, because you have to find a LOT of items in an extremely cluttered junk pile! Other than that, the HO's are not junked up. Most are finding several of one item rather than the seek and find. I'm not real patient, so I made use of the hint button, which refills kinda slowly, but is unlimited... ;) I usually had to use it only for the last item and sometimes not at all. The dialog can be skipped but I found it to be very entertaining. The voice overs are excellent. I always turn the music down so I can't really speak to that.... Some puzzles were incredibly easy -- others not so much -- and some were just downright fun... Catching the mice was my favorite.... One tip -- when you've completed the game, be sure to go back and replay the puzzles -- they are different than when you did them in the game and have a few extra levels to them... Don't miss the mouse catching one especially -- three additional levels to what you originally played. The game is not akin to solitaire where you're just relaxing and don't have to think much, but you won't burn up a lot of brain cells either -- it's in between and just a very enjoyable experience.... Length of gameplay is average.... I would have loved much more. Really enjoyed this one! Rated 4 out of 5 by AdrianaIP from Nice relaxed game that lets you enjoy it slowly This is a relaxed game. Yes, there is a storyline, but it is not that serious nor urgent that you cannot enjoy the puzzles as you unravel them, nor the HOS (which somehow tie to the story). The scenery is pretty enough. And the game of trying to put back the piercings on the helping guy's face still has me giggling. Rated 4 out of 5 by sueandjack from Laura is games are fun. This Laura Jones game is a fun game. It is a lot like the original . It is a good game for beginners or an old pro who just wants to relax and play a good HOG. Rated 4 out of 5 by VirginiaPat from Laura Jones, the hippy, the tattooed man, gramma, & the Cop At first, I thought this was a children's game, but the puzzles are too difficult for kids. Many of the puzzles don't have a skip button, so it's do or die....or go read the walkthrough. Some of the mini-games have a skip button, which I tried, and each time I was directed to the same junkpile to find miniscule items. And each time I tried to skip a game, they added LOTS more items for me to find. Also, in that junk room, translations and spelling were a bit loose; ie. a "tube" was really a tuba, and a "web" was a ball of string. The game was bright and cheerful, however; and there was some thinking to be done in order to decide what to do next. Also, there are lots of charming rooms to visit and the story progressed nicely. There are about 4 "find 30 balloons, birds, etc." and some very different and fun things to do. This is a great family game, young adults would love it, I think, and even lil ole me liked it a lot. No skulls, graves, or lost relatives! 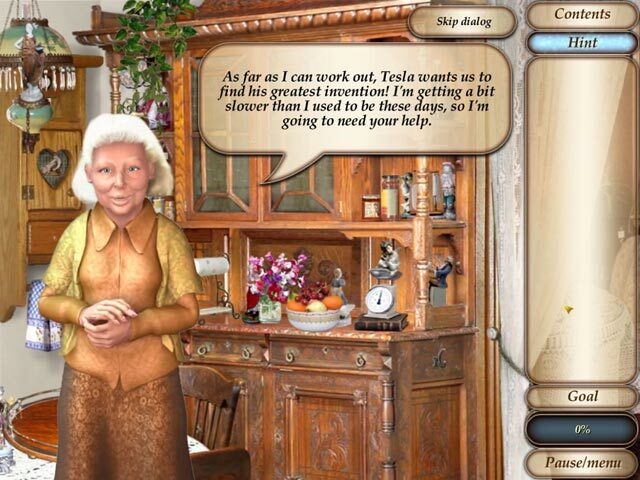 Help young Laura Jones and her grandmother discover Nikola Tesla's greatest invention! Discover Tesla`s secret legacy!